The problem with Fallout 3 and its spiritual predecessor Oblivion is that I've never really been able to get a sense of immersion from them. Partly it's because they're 'big picture' rather than 'fine detail' games. A city looks rather awe-inspiring when viewed from a distance, but once you get in for a closer look you find all its custodians staring at walls and drastically shifting personality from dialogue line to dialogue line. The attempts to make characters appear to act spontaneously just come across as wooden and unnatural. But for the purposes of this column I think the main problem is with the fast travelling. If you went out of your way in Oblivion you could acquire a horse, but Fallout 3 just leaves you to hike. Which is slow and boring no matter how many giant scorpions you sprinkle on the road along the way. So obviously there needs to be a fast alternative, which in this case is the ability to click your heels together and teleport to any location you've been to before. And that spoils the experience for me. I'm of the feeling that World of Warcraft is, on balance, a force for evil in the world today, but I can admire its design just as one could admire the efficiency of Nazi Germany. I like how its fast travel system is an unskippable journey through the land on the back of some mystical beastie, because it's both a faster option than walking and allows the world to keep a tangible sense of bigness. Yes, I know, mages can create instant teleports to cities, but that's a specialised option. In fact, when I played a mage, I used to hang around the cities selling teleports to non-mages for one gold each so I could eventually afford my own horse. Screw your world-saving quests, Blizzard, I can make money my own way. I was role-playing as the anti-hero of some 18th century picaresque. Now go look up what that word means. 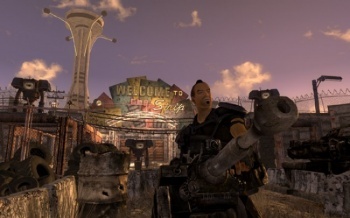 When you instant fast travel in games like Fallout 3 you miss out on the adventure. If you had to ride a horse or a motorbike to your destination you might have an exciting encounter with NPCs, or catch a glimpse of something so intriguing on the horizon that you decide to take a detour to investigate it on a whim. Surely the whole point of the sandbox or open-world model is to give the player the chance to fill the gaps between major events with adventures of their own. In an attempt to boil this down to a manageable, understandable rule to keep in mind, I'm of the opinion that a good open-world game should feel like you're playing some kind of TV adventure serial, like Monkey Magic or the various incarnations of Pokemon. There's an overarching story and fixed events on the trail of the overall quest that the heroes are always going to be moving towards, but in between the major events come shorter, episodic adventures as the protagonists stumble upon distractions. Like stopping to defend a village from bandits, or follow the trail of a secret treasure, or napalm a school building and pour the ashes of the children over their erect, twitching knobs for sexual release. Or does that only happen in the TV shows I watch?